Neat tubes of algae lined most of the pipes. The wood platform should have had better bracing, because a few years after installation that the wood began to sag under the weight when the three 55-gallon barrels were full. Still, the sag was okay, but recently the wood had begun to rot and carpenter bees had drilled into it even though it was pressure treated lumber. It was time to replace the platform. We took advantage of the slow beginning of the wet season in June and drained the barrels. Then my husband dismantled the piping and removed the barrels from the damaged platform. He thoroughly rinsed out the barrels and let them completely dry out. Neat tubes of algae lined the pipes. 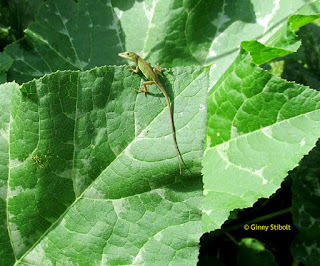 They were added to the compost pile. Lesson learned: avoid wood. 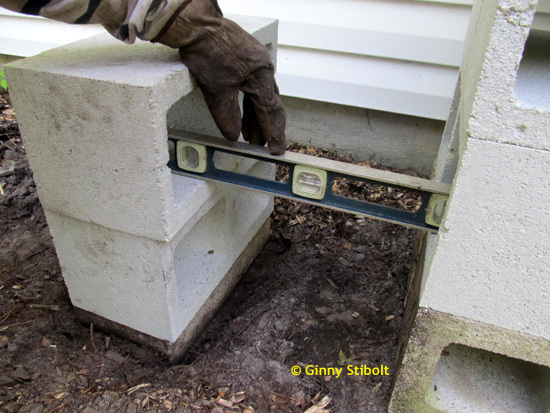 Cinder blocks offer a number of advantages for this situation, so we made the switch. Checking the levels. 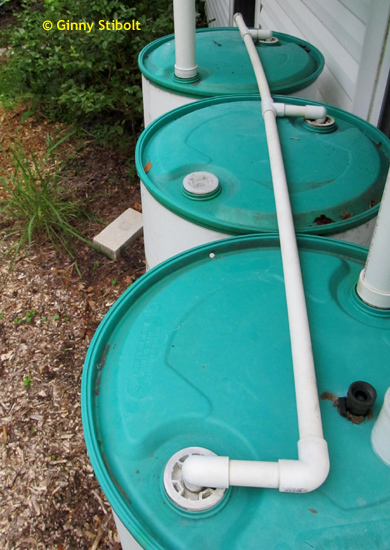 It's important that for this type of installation that all the barrels are at the same level. 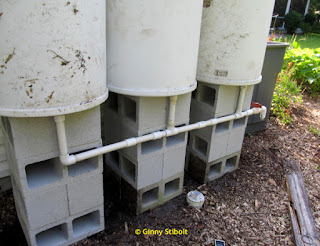 Each barrel sat on its own tower of cinder blocks This time the plumbing is exposed. 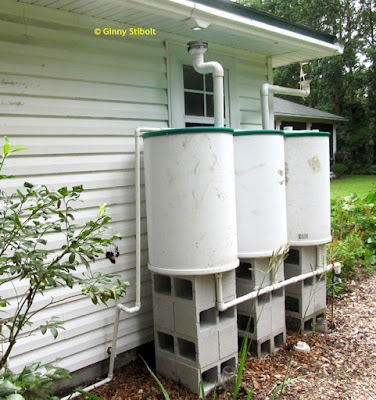 He reused the water-tight screw-in fittings in the bottom holes of the barrels. This is what allows all the barrels to fill up and drain as a unit. 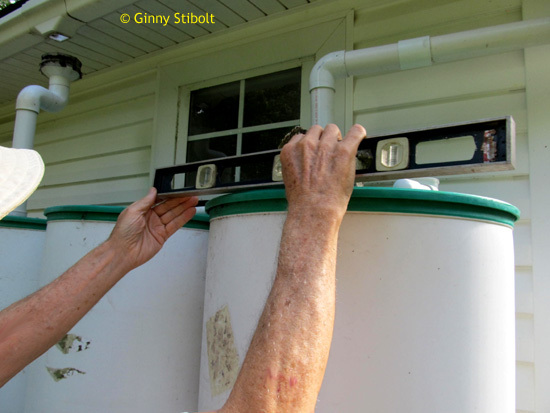 The drain pipes were hooked together and then to the spigot. The barrels were not as elevated as before, so extensions up closer to the gutter drains were needed. 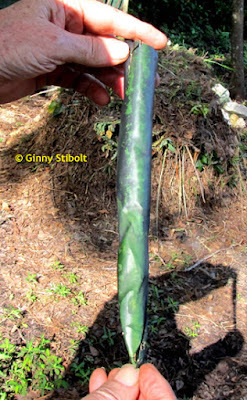 A metal stake was attached to the spigot with a plastic tie to stabilize it. Then the hose was attached. We were ready to go... A few weeks later: Checking the levels after the barrels were filled. Then the rains came and the barrels were quickly filled. 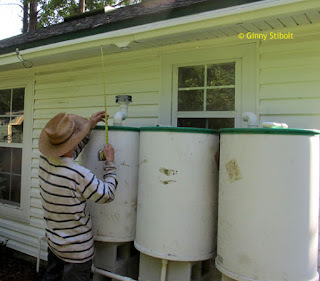 After a particularly heavy rain, my husband checked the levels between the barrels, because the 3 barrels need to stay even. One other item, is the overflow pipes. When the barrels fill up the excess water is directed through a pipe attached to the tops of the barrels. This pipe is attached to a hose that carries this excess water out behind the shed to a swale where it can be absorbed into the soil. 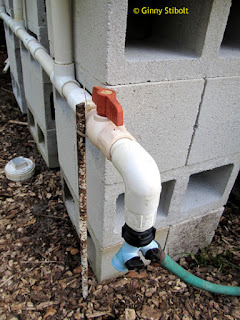 At ground level the overflow pipe attaches to a hose--to the left of this photo. Top view of the overflow pipes. 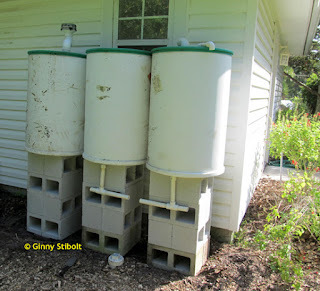 Now our 3 elevated barrels are useful again. Yay! 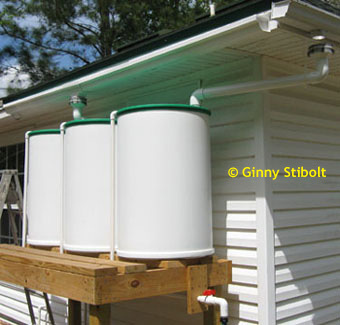 Note the Seminole pumpkins to the right of the rain barrels in the above photo. They are still going strong in August. What a bountiful crop we've enjoyed. A Seminole pumpkin watcher...There is a a lot to watch for because the pollinators are thick around the pumpkin flowers. 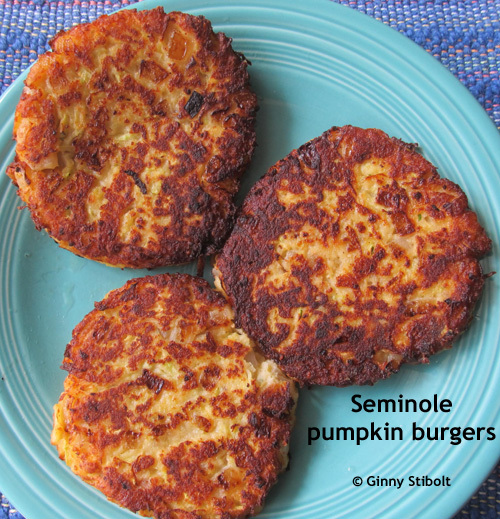 These Seminole pumpkin burgers were delish! The Seminole pumpkins have been fantastic this summer well after all the other members of the squash family have given up in the hot, wet Florida summer. I've made several batches of squash soup that I wrote about in Squash family on our menu.The latest rendition of this soup included a bunch of lime basil, which gave it a sharper citrus flavor. I wrote about how well this does in our summers in Lime basil. I've also made Seminole pumpkin bread using a modified zucchini bread recipe--also delicious. But the burgers were a new innovation. Enough olive oil to have about 1/8th of an inch in the pan Mix all ingredients (except oil) in a bowl and adjust the consistency with the potato flakes so that the patty stays together. Cook for several minutes on each side, but move the patty around in the oil so it doesn't stick. Cook one side to brown as shown and flip to other side.Cook only 1 or 2 burgers as once to keep enough room to flip the burgers. Yummy as is, but filling. We each ate only 2 or our 3. The next day, we used the remaining 2 to make cheeseburgers with a slice of tomato and served with Mayo and lettuce on whole grained bread fried in olive oil. their amazingly eye-popping purple of fall. 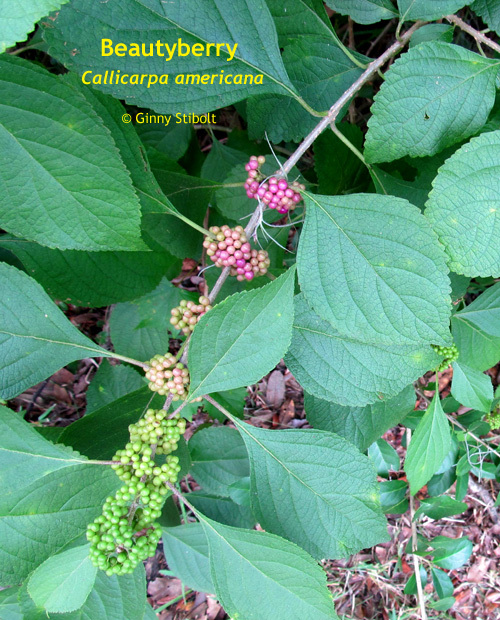 You know it's officially late summer when the beautyberries start turning purple. They will become unbelievably purple and will feed the migratory birds that come through our yard this winter.